RICHTON, Miss. — When Superintendent Noal Cochran had an open teaching position in this quiet town, he looked for applicants at the bottom of the salary ladder—those with as little experience as possible. When he needed a new football coach, he wanted a rookie “straight out of college” who would accept a smaller stipend. And when he needed new textbooks, he chose history over physics or chemistry—subjects less likely to need updating. “When you’re trying to survive and make payroll, you really don’t worry about textbooks,” Cochran said of his district, which serves about 700 students and has been underfunded by a total of $5 million since 2011, according to The Parents’ Campaign, a nonprofit advocacy group that supports public schools. Cochran detailed his penny-pinching priorities for this small community east of Hattiesburg on a recent morning in front of the elementary school, where exposed pipes and electrical wires snake along ceilings. The school compound is mix of dilapidated brick buildings and aluminum trailers next to a field of rusty playground equipment. With school underway throughout the state, superintendents like Cochran have few options for meeting their districts’ many needs, from classroom supplies to coaches. Since 1997, Mississippi has only fully funded its school system three times, shortchanging schools by an estimated $1 billion in the past four years alone. The shortage of state support enrages educators, advocates and parents, who say Mississippi’s lagging test scores and dismal graduation rates cannot be fixed without better state funding. Only 62 percent of Mississippi’s students graduate from high school within four years—far below the national average of about 78 percent. Resources and facilities are lacking: One out of three eighth-graders in Mississippi attends a school without a science lab, according to the federal Office of Civil Rights, compared to one in five in the rest of the nation. 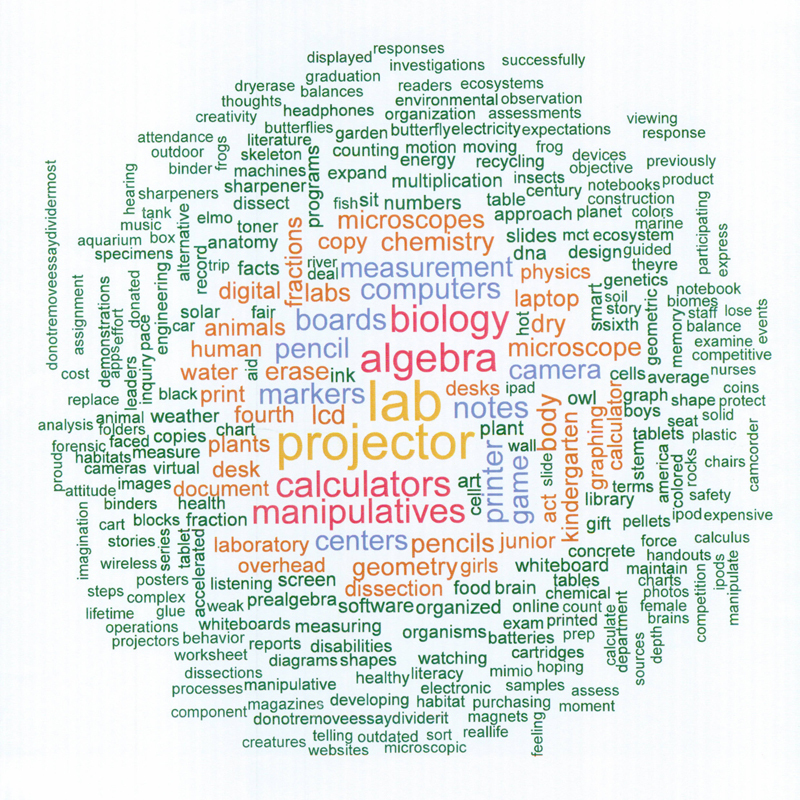 The most common words in math and science Donors Choose grant requests by Mississippi teachers. This shortage has forced many teachers to look elsewhere for assistance. On the website DonorsChoose.org, an online charity that allows teachers to seek matching funds for grants and solicit other donations for classroom items, nine Jackson Public School teachers have requested more than $7,000 for basic supplies like books, equipment for science experiments and math games. Teachers throughout the state are asking for paper, pencils and rulers, posting more than 180 grant proposals outlining their many needs on the Donors Choose site. Last year, the state distributed debit cards that ranged from $175 to $225 based on average daily attendance numbers to 35,000 teachers to help with classroom expenses. For many teachers who taught several classes a day of different students, the cards boiled down to about $1 per student for the year. • The Natchez-Adams School District in southwest Mississippi has eliminated 12 special education teacher assistant positions and will reduce the district’s athletic budget by more than $40,000. The district is also putting off buying any new textbooks. • The Hattiesburg Public School District cut 23 teacher positions during the 2012-13 school year, and was unable to add after-school programs. • Water Valley School District Superintendent Kim Chrestman is relying on grant money to fund computers and Internet at his three schools in this district of about 1,200 students south of Oxford. • Forrest County School District Superintendent Brian Freeman will not fill four open teaching positions this year. 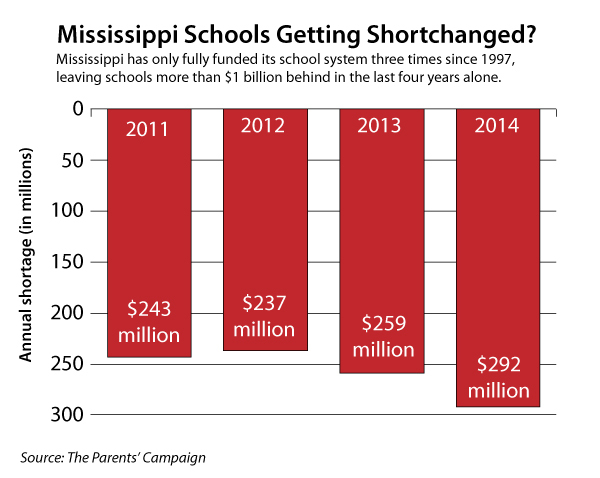 The debate over school funding has long been a polarizing topic in Mississippi. In March, several Democratic state lawmakers called for an increase in education spending, which they said could improve schools by providing more teachers and classroom assistants. For many Mississippi school districts, a state law passed in April has added new challenges. The law—which mandates for the first time how long a student must be present to be counted in that day’s overall attendance—could result in some districts receiving even less state funding, leaving many to scramble at the start of the school year. Since 1997, school districts have received money based on a complex formula known as the Mississippi Adequate Education Program, or MAEP, which takes into account such factors as average daily attendance and the percentage of students who qualify for free or reduced-price lunch. Prior to this year, each district calculated daily attendance in its own way. While some counted students who were present for half the day, others counted any student who came to school at any point of the day. The new law requires that districts count only those students who are present for 63 percent or more of the instructional day. State Auditor Stacey Pickering says the law will encourage schools to keep students in classrooms all day, and to report more reliable numbers. “[This is] a Democrat and Republican, black and white, rural and urban solution. 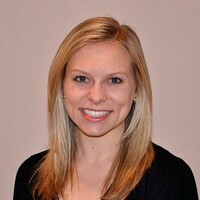 Everybody recognized and saw the problem,’’ Pickering said. But because schools provide teachers and supplies based on enrollment, and not just on attendance, funding calculations should include those numbers, educators and advocates say. “You have to provide a teacher and a desk and transportation and textbooks for every child enrolled, not just those that show up on a given day,” said Nancy Loome, executive director of The Parents’ Campaign. Ivey says that it will most likely be December before districts see how the new law will affect their funding, since average daily attendance numbers from October and November this year will be used to determine how much money each district will receive for the 2014-15 school year. 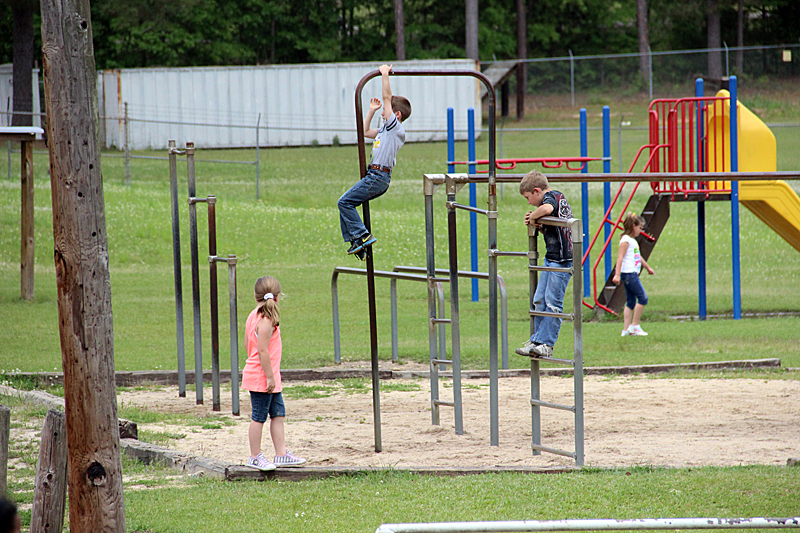 In Richton, Cochran is bracing for further cuts. The town’s median household income is about $25,000, not enough to supply a strong tax base that could boost the district’s local revenue. 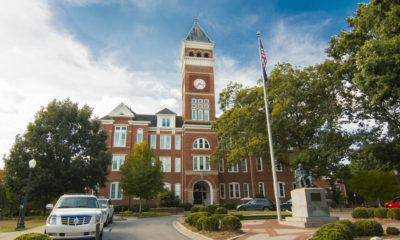 Yet compared to other areas of the state, Richton is also not poor enough or behind enough on test scores to attract the attention of donors and nonprofits, he said. 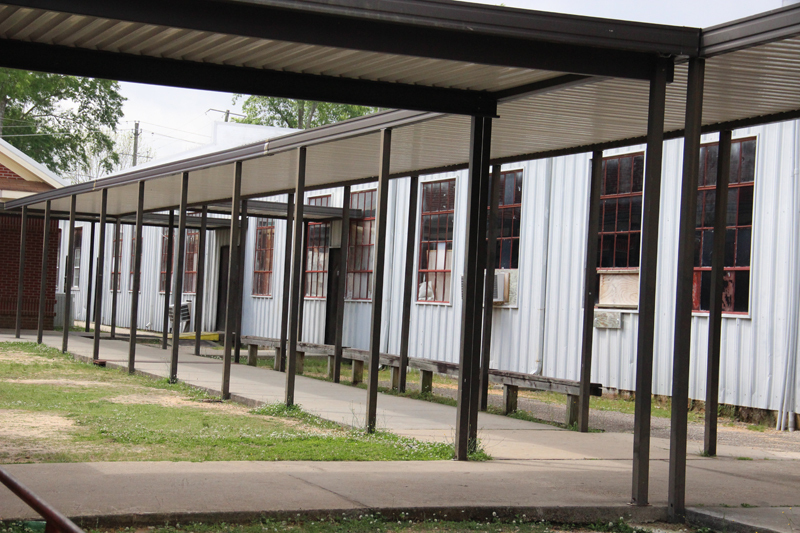 Some test scores have slipped over the past few years in Richton, but the district is still performing above the state average in many subject and grade level tests.